You really have to ask yourself: what kind of credible artist wears a Kentucky Fried Chicken bucket on his head and a Friday the 13th mask? Most people would think he must be somewhat of an insane wacko. Maybe it's a need to protect yourself from being recognized, but then again when you're over six feet tall you do tend to stand out a bit in the crowd. Colma is the gifted California based guitarist's new album of acoustic guitar pieces, I kid you not! The disc is a collection of 13 melodic songs with much less reliance on trademark frantic guitar histrionics. Walking through a few tracks... "For Mom," as you might guess, is a bit on the accessible side. "Whitewash" starts with a slow groove and gets a bit groovy, but no real bust out leads here. "Big Sur Moon" is full of echoey glissando guitar leads a-la Steve Hillage Live Herald era. 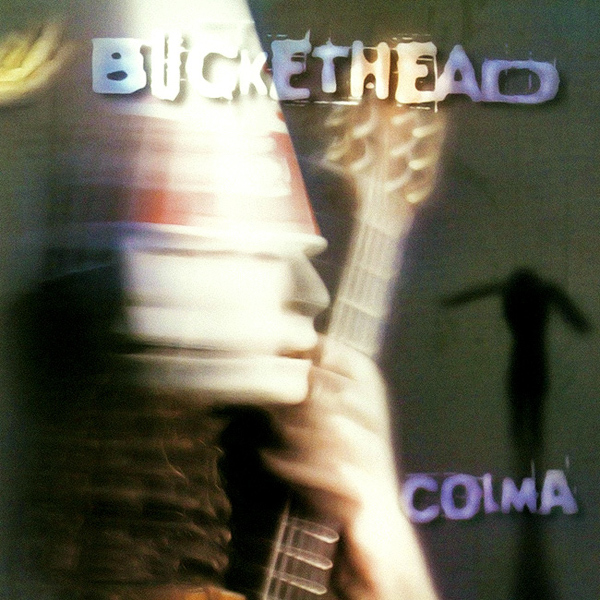 Buckethead is helped out minimal effort with Brain (drummer) and Bill Laswell (bass) helping out on one track. Other than that it's just him on guitars and bass. The CD is a slight take on the bass and drums trend since the rhythm base for all the tracks is looped. Well the Colonel may probably consider some of this music as backing tracks for a KFC commercial but it is smooth change of pace for an artist building a reputation as a modern guitar giant (literally). It is light faire for the guitar enthusiast seeking a headbashing event this time around, but it does indicate the artist's balance toward mellower melodic arrangements. And it is good too, by the way!